A sample of the counterfeit Samsung earbuds seized by U.S. Customs and Border Protection officers at Dulles Airport. 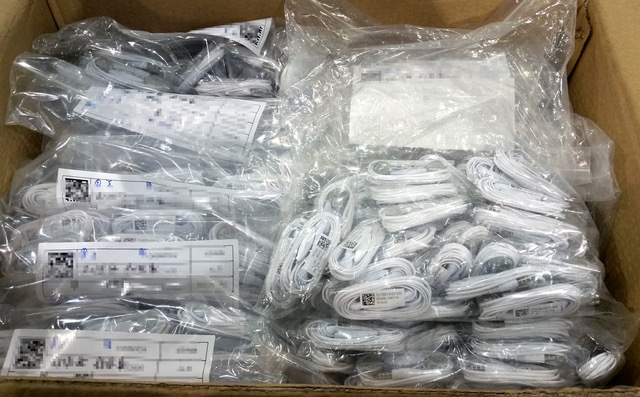 U.S. Customs and Border Protection officers busted a shipment of 60,000 counterfeit Samsung earbuds at Dulles Airport. It was a big haul for CBP; the earbuds, if they were genuine, would hold a list price of around $360,000. The shipment of 120 boxes came from China and was in transit to Brazil. The customs manifest listed the cargo as headsets, but when CBP opened up the boxes in April, they found 500 earbuds with Samsung branding on them. Inspectors detained the shipment and contacted CBP’s Electronic Center for Excellence and Expertise in Los Angeles. CBP has 10 centers across the nation specializing in different products. The report came back from the West Coast: the earbuds were Samsung in name only. “Customs and Border Protection will continue to work closely with our trade and consumer safety partners to identify and seize counterfeit and inferior merchandise, especially those products that pose potential harm to American consumers,” said Wayne Biondi, CBP port director for the Port of Washington Dulles in a press release this morning. This bust is a larger example of CBP’s increased activity at Dulles. In fiscal year 2016, CBP seized more than 31,560 shipments suspected of violating Intellectual Property Rights, a 9 percent increase from FY 2015. CBP seized around $3.8 million of counterfeit goods on an average day. The busts led to 451 arrests, 304 indictments, and 272 convictions by ICE Homeland Security in FY2016. According to the U.S. Homeland Security Intellectual Property Rights Statistics for FY 2016, 45 percent of seizures were Chinese products, and 16 percent of seizures were of consumer electronics.